Get 15 mobile marketing campaign ideas proven to work for media and entertainment apps, plus real-life examples from brands like Netflix and ESPN Sports. First things first: what do we mean when we talk about media and entertainment? They’re both pretty broad terms, so we’re defining them as news, sports, and streaming (both music and video). 89% of app users prefer to access media through apps. Users are on the go, and they want to take their entertainment with them. But that doesn’t mean your ideal users will discover your app. Competition is fierce. Smartphone users and app download rates continue to increase, but aren’t keeping pace with the number of apps that continue to become available--currently over 2 million in each of the leading app stores. With numbers like that, it’s easy to see why apps can get lost in a crowded market. Our own research has found that 40% of users are still using Media & Entertainment apps one month after they downloaded it. Not bad--but that also means a full 60% of users have churned, or are no longer using the app one month later. User attention is in high demand. It’s inevitable some users will churn, but with the right mobile engagement marketing, you can create powerful relationships with your users that keep them coming back for more - boosting their lifetime value and retention. What you need to delight and engage users is an experience that feels particularly relevant to them. That’s what mobile users have come to expect, and that’s what keeps them engaged long-term. Let’s take a look at the campaigns that benefit M/E apps like yours the most, and how to get started. Ask yourself: who’s using my app? No marketing campaign will get the results you’re looking for if it’s not targeting the right user. Here’s how you can be sure you’re attracting high-value users to your app. Is your messaging created with your ideal user in mind? 2. Why YOUR AUDIENCE SHOULD CARE. When you’re creating copy for either of the major app stores, make sure your messaging is doing the work it’s supposed to do. That way, you can be confident that it’ll attract the type of users that you’re looking for. Hulu makes it clear what users are getting by signing up. And using a recent still from a popular show is a great way to increase user anticipation. 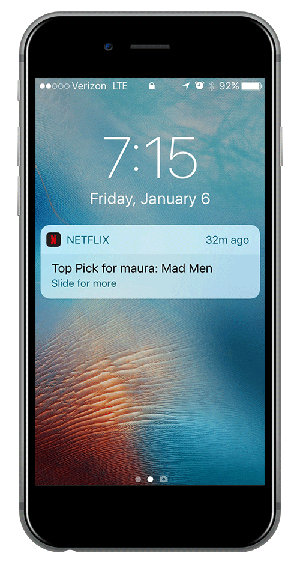 Netflix's OITB push notification is the perfect example of knowing your audience, and hitting them with a timely and engaging message that makes them want to swipe through. On the other hand of the equation, sending users who have never watched or have no similar content interests to Orange Is The New Black is a surefire way to piss off your mobile user base and cause some to churn. What are your high-value acquisition channels? Which channels are bringing in users with strong engagement and lifetime value (LTV)? App downloads used to be every mobile marketer’s favorite thing to track, but times have changed; Nowadays, marketing aren’t focusing on app downloads as a key metric. You’re not winning if an acquisition channel attracts thousands of users who churn days later. Instead, monitor the Lifetime Value (LTV) to make sure you’re attracting and retaining high-value users. The Skimm's Instagram ad gets straight to the point with their value proposition and has a clear CTA. Invest in a mobile marketing platform that gives you insight into attribution. This way, you’ll know where high-value users are coming from since you’ll probably be advertising in several different places, like social media and paid search. Understand each channel’s true impact by tracking the sessions and LTV of the average user these channels bring in. Reconsider channels that attract a higher rate of users who churn, and invest the additional spend in places where you’re obtaining high-value users. If there are groups of users that are particularly relevant to your app, take advantage of services like Facebook’s Lookalike Audiences. Lookalike Audiences lets you send Facebook a list of valuable customers--the customers you wish you had more of. Facebook will show your ads to Facebook users similar to your high-value customers. Create user funnels (if you haven’t yet). Understanding the app user lifecycle is crucial to this part of your mobile marketing strategy. Where your users are in the lifecycle helps determine the best way to engage with them. Different marketing channels work at different points; for example, with a solid mobile engagement platform, you can set up different funnels to evaluate user flows, conversion paths, and in-app actions. Onboarding is crucial to user retention. Users don’t waste much time deciding whether they like an app or not, so make your app’s value clear from the get-go. It typically starts the first time the user opens the app, and progresses through several subsequent user actions. Create an onboarding completion funnel. This funnel shows how many users progress through each step of your onboarding. If a significant number of fall off between certain steps, it indicates that something about the app or the onboarding process isn’t working. For example, if allowing location services during onboarding contributes to user LTV but only a small number of users actually do so, that’d be a great place to start. 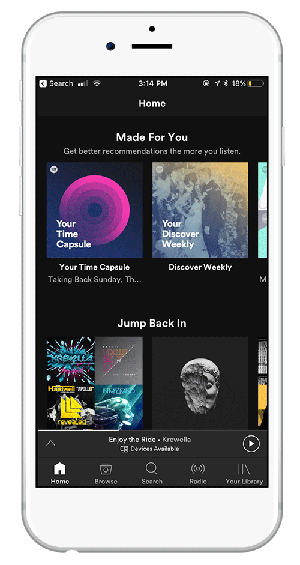 Apple Music uses onboarding to ask new users about their musical tastes, so they can make better recommendations for playlists, new music, and more. To figure out what that is, you can do some user testing, whether that’s getting input from members of other teams in your company, or running some user testing. You may need to reevaluate your onboarding process to ensure you’re delivering clear, concise instructions that highlight key app features and promote engagement. Conversion. Conversion funnels are straight-forward, and also a must. You’ll see how many users start the path to taking the primary action your app is built around. Depending on what your app offers, it could be fairly complex. They evaluate the results. Factors like ratings and user reviews come into play here. User makes a selection--time to download! User starts checkout if the app is paid, or goes straight to download if it’s free. Post-download, the user opens their new app, and is directed into the account creation flow. User finishes creating their account, and enters their app. Conversion funnels make it easier for you to discover areas where you can improve your app’s user experience and identify potential bugs. When you review your conversion funnel, look for any significant drop-offs in the number of users proceeding from one step to the next. This will help you pinpoint what’s keeping your user from progressing to the next step, and ultimately converting. App onboarding is a short series of in-app messages a user sees when they open your app for the first time. The goal is to help these new users find their way around your app and articulate its core value. Help new users find their way around your app with a series of in-app messages that they’ll see as soon as they log in for the first time. Show off what makes your app great: Key functionality and benefits, cool features, etc. By the end of the introduction, users should be clear on how to use your app to complete basic tasks like stream a video or find a relevant playlist. App onboarding is especially important for media apps because it allows users to personalize their preferences so you’re able to serve them up the experiences they crave. PRO TIP: M/E apps tend not to end their onboarding experience with permission requests for push notifications or location like other industries do. Part of this is because many M/E apps (apart from some news apps) aren’t taking advantage of mobile marketing. This is a huge missed opportunity, as our research has found that push notifications increase engagement by 88%. The permission request should match the look and feel of your app and explain the benefit the end user will receive if they opt-in. Including permission requests at the end of your app onboarding experiences boosts their likelihood of opting in since you have iterated what’s in it for them. Spotify syncs to multiple user devices. 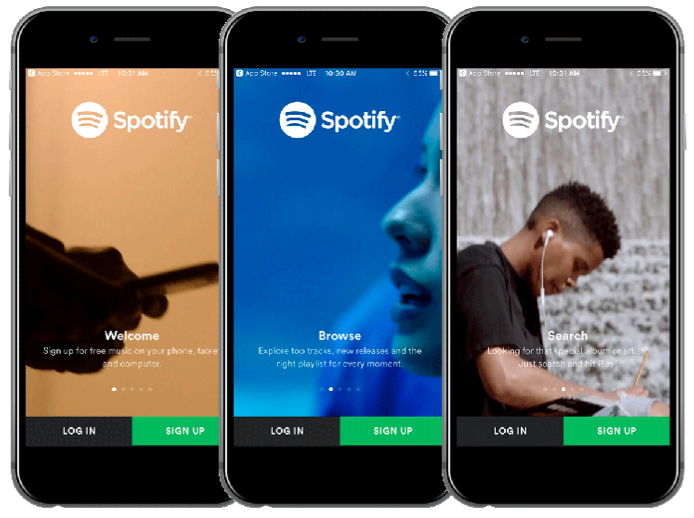 When a user opens the app on a different device, Spotify anticipates anticipates that the user may want to switch devices--and uses in-app messaging to make it a seamless experience. PRO TIP: Use an interactive tutorial to walk users through new features. SoundHound points out new functionality, and makes it easy for users to try it out on the spot. Too many apps overlook how they ask users for the various permissions their app needs to provide the best possible experience (push, location requests, etc.). sers tend to be happier when they’re in place, but they’re also not typically inclined to grant permission for an app to use them right off the bat. What’s the best way to get those permissions? It’s tough to resist the latest and greatest, right? For users who are opening your app without something specific in mind, guiding them to a popular new option is a better user experience than forcing them to go down the path of discovering content themselves. Offering a one-day only discount, or hosting a special sweepstakes for concert tickets? Let users know while they browse your app so they can take advantage. PRO TIP: Avoid blasting every sale you have to the masses. Segment your offers based on user history and searches so they’re highly relevant. For example, if a user has never listened to Adele in your app, it’s best to exclude them from your promotional message about her upcoming concert. The History Channel effectively uses in-app messaging to serve up a new offer based on browsing history. When users convert within your app, it’s important to have in-app messages in place confirming these conversion actions. A simple confirmation message will ensure their transaction is complete, reassuring them that they’ll be subscribed to all the breaking news they need. PRO TIP: Follow up a transactional in-app message with an email to users so they have the details they need in an additional place. After a user has spent a little time in your app, request that they give you a rating. A great way to do this (and encourage positive ratings in particular) is to ask if they’re enjoying the app. Speaking of reviews, creating an in-app message that asks users to ‘rate the app’ via an NPS score is a perfect way to separate your promoters from the detractors. If a shopper’s rating indicates they are neutral or a detractor, you can have the in-app message request that they provide feedback via a text field. You get valuable insights into your app’s weaknesses, and users can vent privately rather than in a public app store review. If a user is a promoter, the in-app message can include a CTA linking to the app store so they can leave a glowing review. ESPN does a great job at using in-app messaging to send a custom NPS request to users. They can send promoters directly to their app listing to rate them, and can collect valuable feedback from the detractors. App inboxes allow you to serve up personalized content to your users in several different forms - from a full homescreen experience to one similar to email. They are particularly relevant to M/E apps because of their ability to customize the content being displayed. If you’re a Netflix subscriber, check out your app homescreen. The entire experience has you in mind. 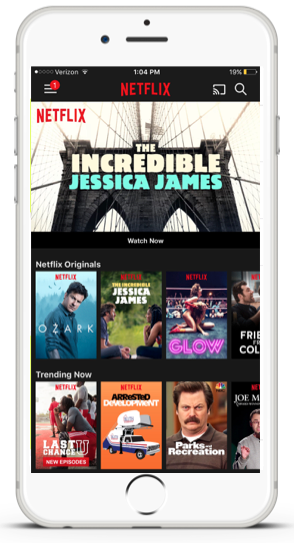 From personalized recommendations to the ability to jump back into a show you’re watching and more, Netflix has strategically designed their app in order to make is a easy (and compelling) as possible to consume content. Given that Netflix is the top grossing app in the App Store and up 233% in revenue from last year, I’d say their personalized approach to app content is paying off. SEND CONTENT OR OFFERS USERS MAY WANT LATER. If your user is interacting with your brand primarily through your app, they may not up to date on big--but not critical to their experience--news for the brand. Fandango uses it to store the links to get tickets to popular movies. Since their app offers a lot of different functionality, the path to get to popular selections is always waiting for me in my inbox, saving me a few steps. Netflix uses inbox messaging to supplement their primary means of recommending or updates users about new content. Netflix knew I’d probably be interested in the new season of The Walking Dead (good call, Netflix). So they sent both a push notification (more on those in a sec) and an inbox message. While I’m not likely to forget about the TWD, I’ve stopped in to my inbox to remind myself about other individualized recommendations. We know push notifications make some marketers nervous, and it’s true: when done poorly, push increases churn. But before you decide not to use them at all, look what happens when they’re done well: they can increase engagement by more than 88%. For some categories, the story our data tells tells is even better; sports app see a 118% increase in engagement, while music services see an 177% percent increase! But to get these kinds of results, segmentation is key. Group users based on similar characteristics: location, search history, items in their cart, etc. That way, you’re more likely to create a push message that’s personally relevant to the user, and justifies interrupting their home screen. What constitutes as ‘breaking news’: True story - I once receive a breaking news push notification at 3am that simply said, ‘Smoking man arrested in front of non-smoking sign’. While I can now look back and laugh about what was clearly a mistake, at the time I was angry and deleted the app. The lesson learned here is only send actual breaking news - things that truly matter to your user either based on preferences, location, or the sheer magnitude of the story. Time zones: Per the above, you need to be mindful of people’s time zones and weigh that against your breaking news alert. If it’s 4am somewhere, is the story still important enough to send? Or can you hold off? Since media & entertainment apps thrive off fresh content, it’s important to keep users in the know about things they care about. Is the new season of House of Cards officially live or Kendrick Lamar’s new song? If you know a user is interested in a particular type of content - letting them know when it’s available is a surefire way to boost engagement. Hard to resist, amirite? Short sales create a sense of urgency that makes them especially relevant for push notifications. Since push appears outside the app, they’re powerful in terms of redirecting the user’s attention back to the app. PRO TIP: When it comes to push notifications, copy is key. Especially when you’re pitching an offer. Redbox relies on context and draws on emotion--the Monday blues--to create a winning message on a slow movie night. Holiday movies. Holiday playlists. Holiday events. 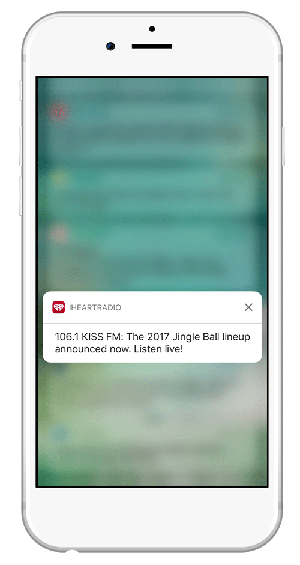 Your users are looking to get a little holiday spirit in their lives, and a push notification that take advantage of that is another way to bring personalized push to your users. A number of entertainment and media apps operate on a freemium model. 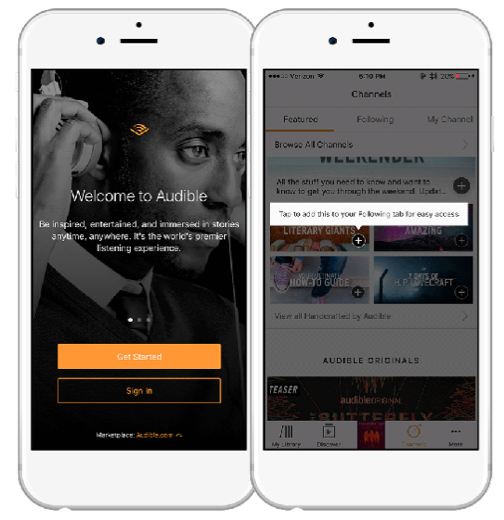 Users get a free baseline of features just by creating an account, but the premium features, or access to all features, are reserved for paid subscribers. Use a push notification to remind your highly engaged users how much more they get when they pay--the kind of specialized features that appeal to users who are already enjoying your app. You can include a promotion to further entice, too. Spotify uses a to-the-point push to remind users just how affordable the Family subscription plan is. Location based marketing is really starting to pick up steam in mobile marketing world. Apps can use geofences to send in-app messages are push notifications, but are sent in real-time when a user approaches or leaves a specific location, like an arena. It’s one of the most user-relevant messages you can send, and can be used for push notifications or in-app messages. But with great power comes great responsibility. The best way to ensure you get geo-push right is to send highly relevant messages to a select group of users, rather than broadcasting a general message to all your users. REMIND USERS OF EVENTS HAPPENING IN THEIR NEIGHBORHOOD. You can put a geofence anywhere. To use them effectively, though, you’ll want to choose spaces that are popular with your users, and align with your offers. If you’re Live Nation, that could mean geofencing a popular event space like the Boston Garden. When I stroll by and trigger Live Nation’s geofence there, the app can send me a push notification about upcoming events there that I might be interested in. OFFER USERS SOMETHING TO ENHANCE THEIR EXPERIENCE. Special promotions and services through your app while they’re at an event, or near a particular landmark are the perfect way to offer your users value. The San Francisco 49ers use a geofenced in-app message to give users the chance to take advantage of their partnership with Amazon. Because forgetting the burgers does not make for happy tailgaters. Remarketing uses messaging or advertising outside your app to bring back users who haven’t stopped by in a while. And like just about all app marketing, it gets the best results when it’s targeted to users. Segment your remarketing by the actions a user previously took within your app and their current position in the app user lifecycle. 16. REACH OUT TO LAPSED USERS. How? Try an Instagram or Facebook ad. The idea is to drive them to open your app again. Show off a new feature, or entice them with a special offer, tell them about an upcoming event--whatever you think will grab their interest. Subscription apps are especially common in the Media & Entertainment industry, thanks to the very nature of the content. But as we’ve seen throughout many industries, it can be tricky to do this right. How do you attract users to subscribe? The Freemium model allows users access to limited content for free, or most (if not all) content with some sort of tradeoff - e.g. ads. A few media apps doing this really well include iHeart Radio and Spotify. Both of these media juggernauts offer streaming music for free, if you’re willing to listen to commercials. You lose out on key features like downloading songs locally, creating your own playlists and skipping songs. Free trial gives users a taste of what they’re missing by not subscribing to your app. Hulu, Netflix, and others trust that their app offerings will win users over so don’t mind giving them a taste. According to a 2017 study done by Nieman Lab, news apps are making a comeback as many millennials opt to pay for their news. This is great news for media outlets who have struggled in the wake of the digital age. 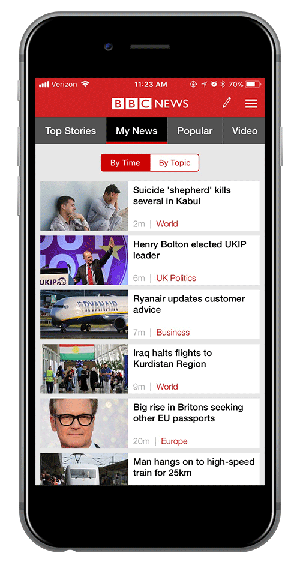 Apps poise a huge opportunity for traditional media outlets to prosper in the digital time. The above “Freemium” and “Free Trial” tactics also work great for news apps. 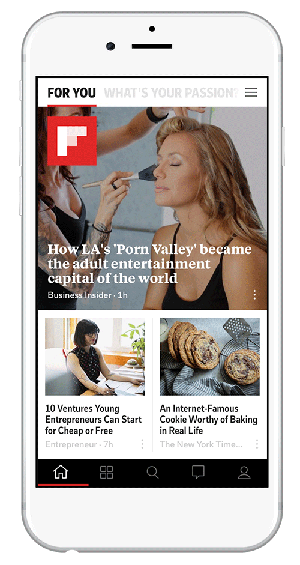 However, it’s very important that news apps offer some of their content for free in order to attract subscribers. This can be done by offering a set number of articles for free per week, or by gating certain news sections to subscribers only. 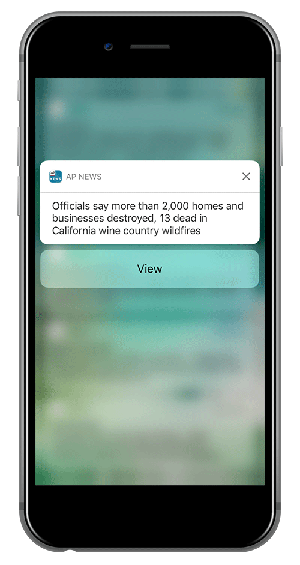 As avid app users, we’re amazed at how many M/E apps (outside of news apps) do not utilize push notifications to engage with their users. Especially because push notifications have been known to increase app engagement by upwards of 88%. Speaking of personalizing to the end user, M/E apps have a serious playing field advantage when it comes to doing so thanks to the very nature of these apps. Users will naturally gravitate towards their content preferences while engaging with your app, so you will have deep behavioral insights to tap into and use to increase app interactions and consumption. First of all, way to make it to the end of this eBook! We couldn’t make it any shorter, and that speaks to how much opportunity is out there for media and entertainment app marketers as your users and potential users look to mobile to fill their needs. Your job? Let your app data guide how you create the best possible experience for your app users. Engaged users are happy users--and happy users are always good for your bottom line. That’s not all we have for media/entertainment apps. Check out the Localytics blog for more handy resources.